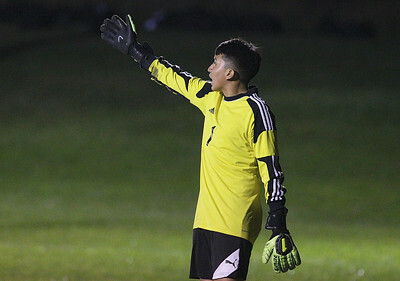 H. Rick Bamman - hbamman@shawmedia.com Harvard goal keeper Hugo Escobar directs teammates in the second period in the IHSA Class 2A Regional soccer match on Tuesday, Oct. 17, 2017. Harvard lost in overtime and shoot out, 3-2. 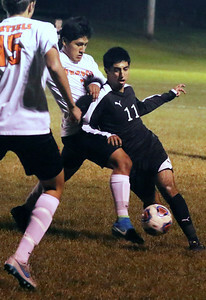 H. Rick Bamman - hbamman@shawmedia.com Harvard 's Danny Juarez moves past a Freeport defender in the IHSA Class 2A Regional soccer match on Tuesday, Oct. 17, 2017. Harvard lost in overtime and shoot out, 3-2. 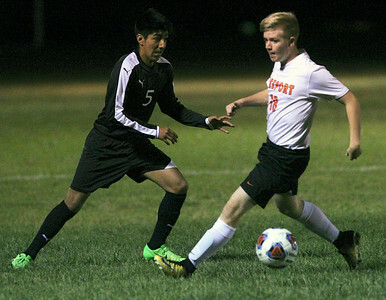 H. Rick Bamman - hbamman@shawmedia.com Harvard's Gabby Popoca plays through Freeport's Luis Ruiz (center) and Grant Luecke in the second period of the IHSA Class 2A Regional soccer match on Tuesday, Oct. 17, 2017. Harvard lost in overtime and shoot out, 3-2. H. Rick Bamman - hbamman@shawmedia.com Harvard's Ivaan Gomez (left) and Alexis Robles celebrate Robles' second period goal against Freeport in the IHSA Class 2A Regional soccer match on Tuesday, Oct. 17, 2017. Harvard lost in overtime and shoot out, 3-2. 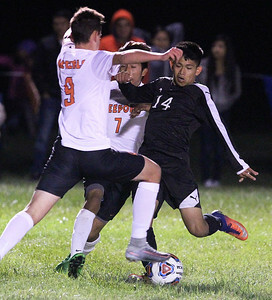 H. Rick Bamman - hbamman@shawmedia.com Harvard's Bryan Sanchez tries to kick through Freeport defenders in the IHSA Class 2A Regional soccer match on Tuesday, Oct. 17, 2017. Harvard lost in overtime and shoot out, 3-2.